Skyress is Shun's guardian Bakugan. She possesses the ultimate ability to resurrect herself. Her Impressive vision scours the horizon. She has gigantic wing span and numerous long tails with sharp feathers at its tip. She is noble with a chivalrous spirit and fair in battle. Shun received Skyress as a gift from his sick mother. She evolves into Storm Skyress. With it's ability to fly, it makes it one of the most powerful bakugan of all the bakugan species. Its special fact is that once defeated, it is able to resurrect itself. It is able to dodge almost any weapon. 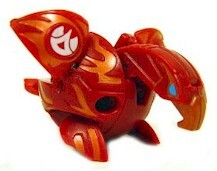 Purchase Skyress Bakugan from Amazon now!